In the state of Oklahoma, you're required to renew your vehicle tag each year. This can be done in person at your local tag agency or online. Here's a step by step of how to renew your car tag in Oklahoma City. Vehicle registrations are good for one year in the state of Oklahoma. Generally, a registration renewal reminder will be sent to you by mail several weeks prior to the expiration. You can also ask your tag agent to instead receive an email reminder. However, note that these are sent as a courtesy only. If you don't receive a notice, it doesn't change the registration renewal date, and there are penalties if you don't renew within 30 days of the expiration date. You can renew your vehicle registration at any Oklahoma tag agency, by mail or online. See below for more details on each renewal option. If renewing your tag by mail, you need your vehicle information. If you don't have the renewal postcard mentioned above, get your car's Vehicle Identification Number (VIN) and state of Oklahoma title or plate number. In addition, you will need to provide proof of liability insurance and pay the registration fee plus applicable fees. Visit the Oklahoma tax agency website for mailing instructions and information on fees. The Oklahoma Tax Commission has a website called "CARS" where you can renew your tag online. Simply enter the last four digits of the car's VIN and the tag number. You'll have to provide owner information, tag number, vehicle identification number, title number and liability insurance policy information. Payment is available through Visa, MasterCard, American Express or Discover. Note: There is a transaction fee. That's it. You now have your new plate sticker if you renewed in person. If you mailed your application or renewed online, it will come shortly or you'll be contacted if there's a problem with your application. If renewing by mail, make sure you keep in mind the processing times. 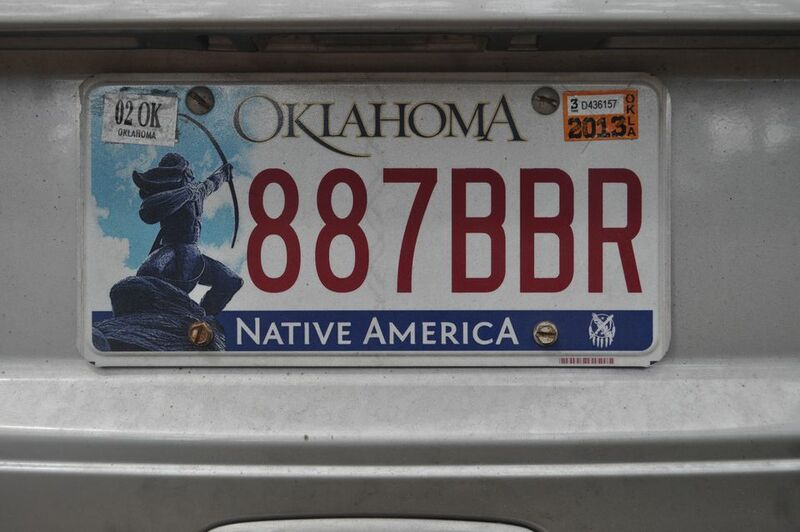 Buying a new tag still requires a trip to an Oklahoma tag agency. Don't simply wait for your renewal postcard. Renewal is required regardless. Fees can change! Always check with the tag agent for the exact amount due for your registration.